Say good bye to incomplete addresses, and return to sender problems. On average, 20% of incoming addresses contain errors. These include spelling mistakes, incorrect street extensions, missing apt numbers or invalid zip codes. Shipping products is not cheap, and each time you acquire bad data it is costing you extra time and money. Do you send packages or other correspondence to your customers via postal mail? We can check any address to make sure it exists as long as it is within the U.S. or Canada. You will be able to put an end to acquiring partial addresses and reducing the amount of return to sender envelopes you get back. Once you create an account with us, you can easily upload your own file through our user-friendly dashboard. This self-service solution allows for you to upload a CSV file for validation. Your files will automatically process once your account is verified, and most turnaround times are less than one hour. Last year we changed our business model and started selling tangible products on our website. It ended up being a fail in the first few months because of the amount of return to sender notices and delayed packages due to poor address acquisition. After implementing Xverify’s address verification tools, we don’t have those problems anymore. Our pricing is simply pay- as- you- go —, no minimum requirement, or long- term commitment. If you don’t use the services, we don’t charge you. Our pricing starts at $0.01 per verification. If you have more data, we can offer you volume discounts. Can I check postal addresses in bulk? Yes, you can upload your data as a batch and we will validate postal addresses in bulk. You simply need to provide a .CSV file containing the address data and upload it into your account. Do you check addresses globally? No, we currently only validate postal addresses within the United States and Canada. We do enable autocorrection for minor misspellings. This means if your user accidently types “Monrow St” and the spelling should be “Monroe St,” autocorrection will make this adjustment. Autocorrection will also correct street extensions. For example, if the user enters “Rd” and it should be a “Dr,” the autocorrection will occur. Can you verify the owner of the house? 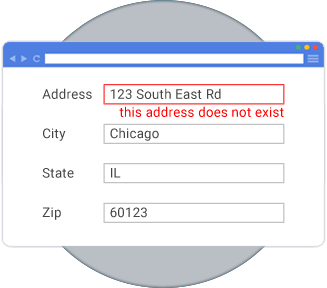 No, our Address Verification tools are just making sure you have an accurate mailing location. We don’t know if it is the right address for your recipient, but we can tell you if the address is deliverable by the postal service. This will eliminate any formatting issues and fictitious address collection. How do you verify apartment/suite numbers? Use our address verification tool to eliminate problems with incomplete and inaccurate address collection.